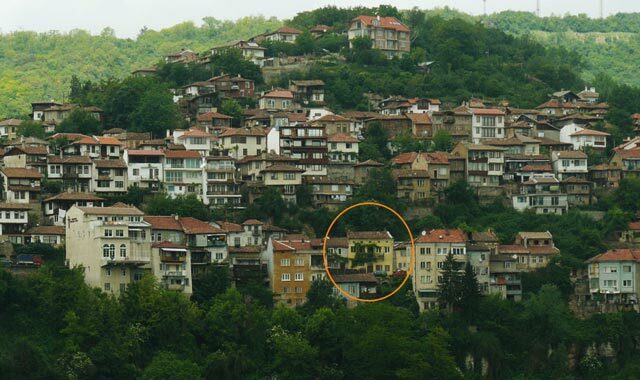 Sarafkin’s house is one of the architectural jewelries in Veliko Tarnovo. It is located on the historical street “Gurko” and is a part of the old revival’s appearance of the town. The house is built in 1861 for the needs of the boyar trader Dimo Sarafina but eventually it is inherited by his wife Anastasia Sarafkata and becomes famous with the name Sarafkin’s house. There is a steep wooden staircase leading to the last storey of the house. The staircase begins from the vestibule. One should pass through a decorative little door and ascend the old stairs leaning on a splendid parapet from wrought iron, that grow into a hemstitched woven balcony. The wooden columns, the ornamented ceiling – with a sun carved in the middle and the dark lids of the windows-all this create a feeling of a coziness. In 1981 the house is restored and committed to the Regional Historical Museum-Veliko Tarnovo. Now, in the house finds place the exposition “Folk-art of Turnovo’s region”, that meets the visitor with the basic signs of the national art, characteristic for the region of Veliko Tarnovo at the end of 19th and the beginning of 20th century. On the 4th floor are separated four exposition halls: “Crafts”, “Folklore costumes, cloths and ornaments”, “Ritual objects”. There also is exposed the interior of the urban (from Veliko Tarnovo) old revival dining-room. In the first hall are exhibited objects, for which manufacture are needed more specific skills: different kinds of kitchen and dining ceramics; silver candlesticks and home iconostases, carved and painted boxes and chests, distaffs and other. The second and the third halls are dedicated to the costumes, cloths and ornaments. Characteristic for the region of Veliko Tarnovo is the quite diverse landscape as each village belongs to different type- flat, mountain, semi-mountain, Danubian with unusual variety of traditional costumes. In the exhibition find place women- ( tunic and double apron) and men costumes, made of home-woven tissues. The child costume of course is accompanied with traditional children toys. The accent is put on the richly embroidered shirts and gay colored woven aprons. The formal costumes are complemented by woven stocks, belts and purses, colorful head-cloths and lovely silver and gold-plated garnishments - buckles, bracelets, earrings, ear-muffs and other. The last hall is dedicated to the ritual objects. They are specially made for some fests and rituals. Different ritual breads are exposed, but mostly Christmas and wedding breads, because the bread is the most important for the folklore man and it’s a “bloodless” sacrifice in all family, calendar and other labor rituals. Also in the exhibition could be find: martenica, eastern eggs, wreaths, wedding flag, “german” for rain, obtained by prayer and other. The photos in the whole exhibition seem to give life to the objects, giving additional information about the holidays and workdays of the people from Veliko Tarnovo a century and a half ago –spinning, threshing, shopping, wedding rituals, traditional musical instruments, different rites, etc. On the 5th floor is displayed in brief the history of the photography in Veliko Tarnovo, which well-deserved could be ranked with art. The gallery of images is a draft of the life of the old Velko Tarnovo’s inhabitants for more than a century and a half, depicting the urban fashions and manners, preferences and influences, the changes in the town and the people in it. The whole exhibition is pleasing to the eye and to the soul, because it is a fairy-tale about the mastery of human hands! Galia Chohadjieva-curator in “Ethnography” section in the Regional Historical Museum-Veliko Tarnovo.